We’d love your help. Let us know what’s wrong with this preview of The Invisible War by Chip Ingram. Examines what believers need to know about Satan, demons, and spiritual warfare. This book helps Christians understand what the Bible says about these threats and shows them how they can safeguard themselves and their families through prayer. To ask other readers questions about The Invisible War, please sign up. This is a book that I will need to read again to get everything out of it. It was very informative and I liked that it was well balanced about this subject. I listened to the book on Audible that was read by Dave Drui. If you are going to listen to the book I strongly suggest you listen to this version because Dave's voice is pleasant. I originally tried to listen to the book with the author reading and his voice was grating on me. I will be purchasing the hard copy of this book so I can make no This is a book that I will need to read again to get everything out of it. It was very informative and I liked that it was well balanced about this subject. 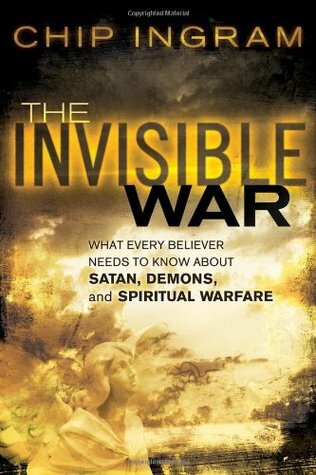 This a well balanced book on spiritual warfare that gave me a lot of insight to the Invisible War. "We do not fight for victory, but from victory"
An excellent book on Spiritual Warfare. I highly recommend it! An excellent, balanced, biblical view of the subject of demonic activity and the Christian's responsibility to recognize and to stand and wage war against these very real forces. Satan and his forces are formidable, but are not to be feared. Jesus has already won the victory and we battle from this victory, not for it. Ingram does a fantastic job of really diving into what it means and looks like to wield the armor of God in relation to spiritual warfare. I really think there's a solid amount of practical knowledge in this book that many Christians need to know and use for themselves and God's kingdom. Very much worth reading. Ready reference for believers wanting guidance on spiritual warfare. Logical layout with summaries giving key Scripture references before major sections. Many practical examples and strategies for winning the war. This book was helpful and provided a lot of useful, biblical information about spiritual warfare. I was turned off a bit in the final section of the book because of too many references to people dressed in black/Goth clothing who were also into the occult or influenced by demons, and by one story about missionaries that was presented as fact (it was published in a reputable magazine, the writer says), but that has no identifying details and can't be backed up with Internet research. The Goth-dem This book was helpful and provided a lot of useful, biblical information about spiritual warfare. I was turned off a bit in the final section of the book because of too many references to people dressed in black/Goth clothing who were also into the occult or influenced by demons, and by one story about missionaries that was presented as fact (it was published in a reputable magazine, the writer says), but that has no identifying details and can't be backed up with Internet research. The Goth-demons connection might have been true for the particular people mentioned in the book, but characterizations like that can perpetuate unhelpful stereotypes even if the writer does say, once, that wearing black doesn't mean someone is influenced by demons. And the missionaries story (which sounds like an inflated version of an account that was published in a book several years ago, and that includes actual names of the missionaries and their organization) reminds me of Christian urban legends and the things people post on Facebook without doing a two-minute Google search first to see that it's only half-true or not true at all. Those elements threatened the credibility of the book and the author; ultimately, though, I think Chip Ingram provides a lot of helpful, biblical information in the book, and he clearly writes from the perspective of someone who loves God and the church, and wants Christians to see the truth of the spiritual world in which we live. He warns against seeing a demon behind every corner, while promoting a heavy leaning on Scripture and biblical discernment. This book was spiritually helpful to me in so many ways. I have been a Christian and firm believer in Christ since I was a child. Unfortunately, I strayed in BIG ways in 2017 after a traumatic divorce. I questioned God, turned to mediums and psychics and lots more. I didn’t even recognize who I was. I went so far as visiting metaphysical shops and buying crystals, candles, incense- you name it. (When those types of establishments used to scare me!) I did purge a lot of those items and am in the This book was spiritually helpful to me in so many ways. I have been a Christian and firm believer in Christ since I was a child. Unfortunately, I strayed in BIG ways in 2017 after a traumatic divorce. I questioned God, turned to mediums and psychics and lots more. I didn’t even recognize who I was. I went so far as visiting metaphysical shops and buying crystals, candles, incense- you name it. (When those types of establishments used to scare me!) I did purge a lot of those items and am in the process of getting rid of even more after reading this book. I am ashamed to admit I fell for this “new age” nonsense for an extended period of time. I knew the entire time that God and Jesus were pulling me back into my Faith. I could physically feel it. This is one of the books I purchased to get myself back on the right path. I may have allowed Satan to confuse me for a bit; but I am back in my faith and asking God for guidance each and every day. This by far has to be one of the best Christian books I have ever read. Without going into great detail, I am going through a challenging time that is still ongoing. I have sought counsel from people that are more mature in Christ. I have repeatedly been told to stand firm on God's promises. I could grasp this concept intellectually but I never knew how to apply this spiritually. This Book with the help of Scripture taught me how. I chose this book to help me prepare for my upcoming trips to countries and people who are considered part of the unreached by Gods word. After reading "The Invisible War" I feel that I am more equipped to face the invisible forces that seek to stop me from sharing Gods Word. This world is getting darker and darker and now, more than ever, we need the truth and we need to know how to fight for our God. Read this book, y’all. Read this book. An interesting view on demonic activity, and warfare from a christian standpoint. I powerful insight to Spiritual Warfare every believer should read. The whole book is chalk-full of practical "how to" ways to stay in the Lord and fight spiritual battles when they arise. This book was mentioned in another book, "For the Joy Set Before Us" by Erica Fye and I am so glad I got it! Chip Ingram has extensive experience with spiritual warfare and is a wealth of knowledge. It was eye-opening, giving real-life examples of spiritual warfare going on in the U.S. and overseas. It also gives reasons why most Western Christians don't seem to experience muc The whole book is chalk-full of practical "how to" ways to stay in the Lord and fight spiritual battles when they arise. This book was mentioned in another book, "For the Joy Set Before Us" by Erica Fye and I am so glad I got it! Chip Ingram has extensive experience with spiritual warfare and is a wealth of knowledge. It was eye-opening, giving real-life examples of spiritual warfare going on in the U.S. and overseas. It also gives reasons why most Western Christians don't seem to experience much in the way of spiritual warfare. It explains the urgency for prayer that is consistent, intense, and strategic and if we'd pray like that, more spiritual battles would be won. The author provides information regarding the war we are in whether we think we are or not! Using biblical support, without sensationalism, he builds a firm foundation for what is happening in this war and why it is still important to fight despite the outcome already being decided, how we should protect ourselves and how we should prepare for battle. It is a wake-up call to the sleepy American Christian that thinks the war isn't here. Chip Ingram faithfully walks the line between not giving "the invisible war" enough credence and giving it to much. His teaching is biblically solid, and it offers hope. I think every believer needs good teaching on this subject, and this book is a great place to get it. I highly recommend this to anyone who is tempted to ignore this part of biblical teaching and to anyone who suspects they may be caught in the middle of the invisible war. I highly recommend this book! Although I didn't finish this book, I gave it one star for the sheer amount of times I tried to read it and couldn't get into it. I finally had enough, so I'm using this review to warn you. Don't bother with this book. Even though I'm sure that Chip Ingram is a good guy, this book was not engaging, and felt below elementary to me. Sorry, Chip. P.S. - I got rid of this book. It is finally, after years, out of my home. This is one of the most biblical, practical, readable books about spiritual warfare I've read. I wish all my friends and church members would read this book to get a better understanding of the reality of the Kingdom of God that is fully present in Christ and that which will be fully realized when Christ returns. This is a very balanced view of spiritual warfare as it uses Paul's illustration of putting on the full armor of God to explain how our enemy, the devil, tries to attack, distract, accuse and abuse us. Most important takeaway: we stand and we fight from victory not for victory. An excellent choice for a small group who wants to grow in their awareness of the battle. I LOVED this book. It was so helpful in understanding spiritual warfare. I have the DVD and workbook as well. Chip is a very gifted teacher. He's very down to earth but bold in his teaching. He doesn't mince words and he backs everything up with Scripture. If anyone is struggling with spiritual warfare, I highly suggest reading this book and doing the series. The cover looks a little crazy, but the book itself is a fantastic look at spiritual armor as outlined in Ephesians 6 and the tools that God has given us for standing firm in our faith. It's a fantastic read, and I actually think that every Christian should know what spiritual armor is, how we put it on, and how we stand firm in trials and temptations. This is a book I'll recommend for years. One of the best studies I've ever done on the spiritual warfare we experience. I love how Frank Peretti spurred my imagination about the presence of the spiritual world, but this book took that and built on it with some terrific facts and Scripture that has transformed my prayer life and motivated me on several levels. I discovered Chip Ingrams book through my church in Sunday school. It gave me a perspective of the spiritual warfare that I have been facing in my life. All of his experiences that seemed to snow ball from the beginning hit home for me and currently brought me closer to God. It taught me more about the armor to use against satans attacks. This was required reading for my EFCA GATEWAY Phase 2 students. This reads (mostly) as a sermon series that was edited for written publication. Ingram takes a balanced, middle-of-the-road position regarding the reality of spiritual warfare. Listened to the audio book version. It was a collection of sermons on this same subject, with the same title, so I assuming the same content. Nothing exceptional here...mere rendition of commonly known scripture.